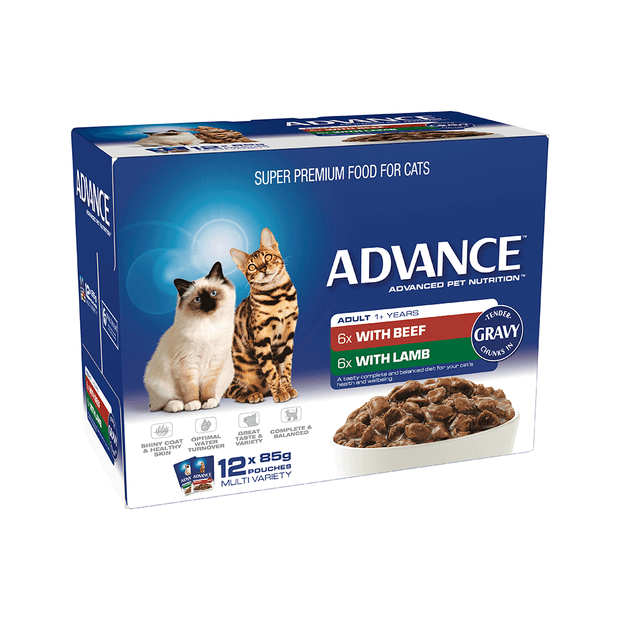 This super premium multi pack is formulated with tender meaty chunks in gravy in a range of delicious flavours that your cat will love. Advance formulas are complete and nutritionally balanced to support the health and wellbeing of your adult cat, made with high quality, Australian-sourced ingredients. WITH BEEF: Meat Derived from Chicken, Beef, Lamb; Binder (Beef and/or Pork); Gelling Agents; Vegetable Oil; Flabours; All Essential Vitamins & Minerals; Colours; Taurine. WITH LAMB: Meat Derived from Chicken, Beef, Lamb; Binder (Beef and/or Pork); Gelling Agents; Vegetable Oil; Flabours; All Essential Vitamins & Minerals; Colours; Taurine. Amazing results on a stray cat I adopted, significant improvement in his coat and overall condition, absolutely recommend.